Another installment in the “Tales From the Tombstone” series. Although never a physically imposing man, William Mahone, left a lasting impact on 19th century Virginia, as a civilian, military officer, and politician. In one way or another, all these pursuits had a connection to the transportation sector. Not surprising, Mahone born on the first day of December 1826 along the banks of the Nottoway River in Southampton County, Virginia, entered the world on the nadir of river transportation during his formative years. By the next decade, 1830s, the railroads replaced waterways as the mode of transportation and travel from Monroe where Mahone grew up. Mahone’s first employment utilized the next major improvement to his hometown, the improvement of the road network. Propped on a horse, Mahone delivered mail for the United States Postal Service while gaining an education from the local schoolmaster. 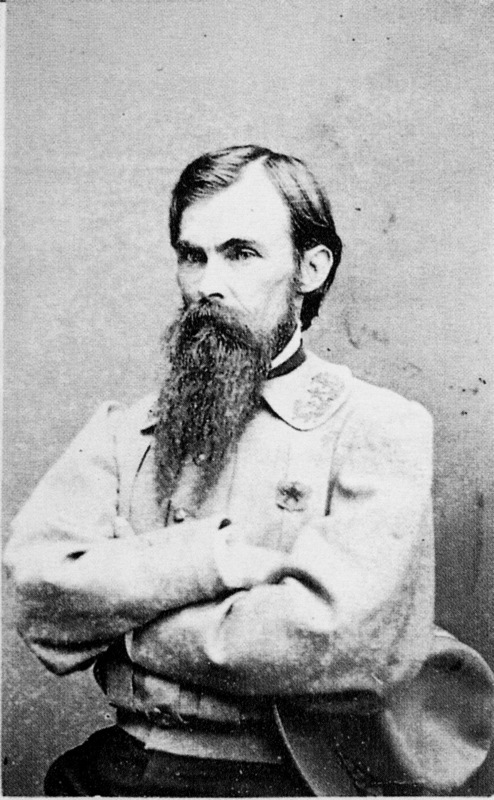 Awarded a spot at the Virginia Military Institute, Mahone studied under future Confederate icon Thomas “Stonewall” Jackson and graduated with a degree in civil engineering in 1847. While earning a living as a teacher in Caroline County, Virginia at the Rappahannock Academy he became intertwined with the “iron-horse” (the popular nickname of the railroads), when he assisted with the laying out of the Orange and Alexandria Railroad. He impressed local officials and was hired to help lay a plank road that emanated from Fredericksburg, Virginia. In April 1853 he was hired as chief engineer to head construction of the Norfolk and Petersburg Railroad and tackled the impediment of the Great Dismal Swamp in the process. Two years later Mahone married local socialite Otelia Butler and eventually had 13 children but only three lived to reach adulthood. With the outbreak of hostilities between North and South, Mahone’s first major contribution to the fledgling Confederacy was to maneuver through a cunning ruse the capture of the Gosport Naval Yard in Norfolk. His first command and the promotion to brigadier general occurred because of his role in defending the district of Norfolk. With the evacuation up the Virginia Tidewater Peninsula, Mahone followed suit and was present from the initial defense of Richmond through the end of the conflict, fighting in almost every major engagement in the eastern theater. Somewhere in his military career his soldiers affectionately began calling him “Little Billy” as the Virginian stood a meager 5’5 tall and topped the scale at 100 pounds. No matter his stature, Mahone’s men proved some of the most stalwart in Robert E. Lee’s Army of Northern Virginia in the last months of the war. His troops were responsible for sealing the breach at the Battle of the Crater on July 30, 1864 and was stout in defense along the retreat to Appomattox in April 1865. After the conflict, Mahone took to the task of rebuilding the Southern states by becoming a driving force behind the railroad network in the eastern Virginia and Richmond and Petersburg region—probably some of the same railroads he had ordered torn up during the last year of the conflict to keep from being used by Federal forces—and Mahone became president of the merger of three railroads in 1867. After a financial panic in 1873, Mahone became a major political leader in Virginia and lead a varied career of success in the public eye. He tried to allocate funding for African-American education, along with other political and economic pursuits. He ran unsuccessfully for governor of Virginia in 1877. Four years later, in 1881, he won a seat in the U.S. Senate as a non-major party Senator—he actually was elected as a representative of the Readjustor Party, an offshoot of post-Civil War allegiances in Virginia—but when Mahone caucaused in Congress it was with the Republicans. This proved initially to be beneficial to Mahone as he was able to gain the support of President James Garfield and became appointed to the chairmanship of the Agriculture Committee. However, the alliance with the Republicans caused him to lose his re-election bid in 1886. He tried his hand at the governor chair in Virginia one more time three years later but when defeated a second time, he kept busy, too busy in fact, and suffered a massive stroke in Washington D.C. on October 8, 1895 at the age of 68. His widow would live into the second decade of the 20th century, passing away in 1911. 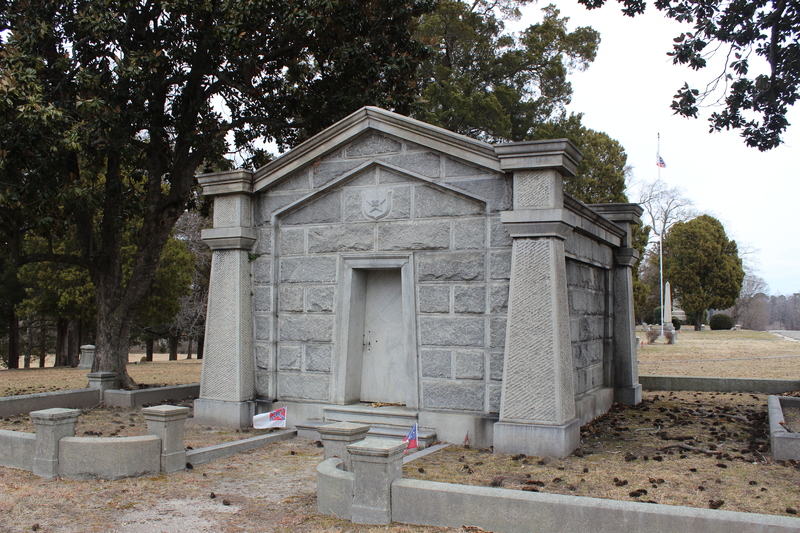 The Mahone’s first residence was in Petersburg and it was in the cemetery there, Blandford, where he was laid to rest in the mausoleum pictured below. This entry was posted in Emerging Civil War, Leadership--Confederate, Personalities, Sieges and tagged Appomattox, Battle of the Crater, Blandford Cemetery, Gosport Naval Yard, James Garfield, Norfolk, Regulator, Republican, Stonewall Jackson, VMI, William Mahone. Bookmark the permalink.